The Mountain nymph, sweet Liberty." On Wednesday evening, the 18th. inst. 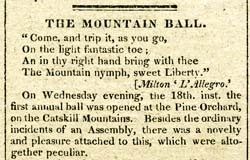 the first annual ball was opened at the Pine Orchard, on the Catskill Mountains. Besides the ordinary incidents of an Assembly, there was a novelty and pleasure attached to this, which were altogether peculiar. It was one of those clear and beautiful autumnal days that seem to diffuse life and gladness everywhere; the mountain scenery was in the fulness of pride, and unusually imposing; and the several parties arriving in the course of the afternoon, were enabled to take views from the Pine Orchard and South Mountain, which for extent and variety are not surpassed by those of any country. Fronting the ball-room, itself at an elevation 2800 feet from the level of the river, was the valley of the Hudson, traced by the eye for a hundred miles, and embracing within the area, cities and villages, the coursing of the craft upon the river, and innumerable rich and variegated landscapes, and all mellowed by the pure atmosphere and the setting sun. Beyond, were the distant high grounds of Vermont, New Hampshire and Massachusetts. And all around were the visible accomplishments of the bold and powerful hand of Nature. Nothing can be more enlivening than the appearance of this ample green arbour, radiant with life and beauty, resounding with music, and reflecting with its numerous lights the lively and animating gestures of its inmates. Coffee and refreshments were served in the course of the evening; and at 2 o'clock the company retired to their respective lodgings. The pleasure depicted upon every countenance - the animation and joy which prevailed every where - and the striking display of beauty and taste - gave to this first attempt the happiest and truest effect. It is simple pastimes such as these that the mind loves to dwell upon. It is then that the feelings go abroad, and extend the links of that chain of nice affinities that give a charm and perfume to existence. Selfishness puts aside its grossness, and learns to meet liberally and warmly. Very narrow and pliable is the heart that cannot share the proffered friendliness of a fellow heart. Throughout, the scene was a novel and happy one. And when one remembers the cheerful and smiling faces around him, the abounding gaiety and good humour, and the beauty that animated the whole; and reflects upon the friendships that are formed, the sympathies that are enlarged, and the kindlier feelings that are awakened; surely the thoughts of these festive will not be hastily chased away, nor the repetition of them be deemed unwelcome. Webmaster's note: The ball was held to attract additional investors by a group of Catskill businessmen interested in building a hotel on the site. And it worked, for after the ball the Catskill Mountain Association was formed, and the Catskill Mountain House was built a year and a half later.